Cancer is something I think we have all become a bit too familiar with. Whether it be a close friend, coworker, family member or a beloved pet it’s safe to say we all would love to see the day that we can officially kick that cancer to the curb, once and for all! The leader of fighting the fight, the America Cancer Society (ACS), holds several fundraisers throughout the year that raise awareness and money to further their extensive research. 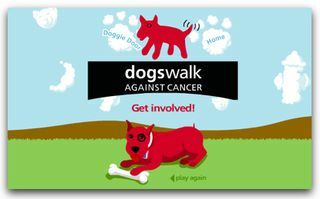 If you’re looking to get involved but don’t know where to begin, this is the perfect opportunity for you and your pooch to give back to this great big juicy red apple that we all love so much and support the fight against cancer. This Sunday, May 3rd, at 9:00 a.m. the ACS will be hosting the 18th annual Dogswalk at Riverside park on 107th and Riverside Drive. Here you and your philanthropy loving pooches can put your best paw forward as you walk to help raise awareness and most importantly funds. Now, if there is one thing I know my fellow New Yorkers are known for its fundraising…and I mean fundraising in a huge way. Go big or go home right? The walk-a-thon is just $35.00 to register you and your dog and is less than a mile (approximately equal the distance from Saks to Bergdorfs, roundtrip), but your participation and support will last well beyond the short distance walked. Insider Tip: The first 700 registered participants receive a “Doggy Bag” valued over $50.00 in goodies! The month of April brings about mixed emotions as all New Yorkers are THRILLED that old man winter is on his way out and warmer days are ahead, but the showers that this part of year brings about can be a nightmare for fellow fashionistas. (can I get an Amen from my fellow curly haired friends?) Our pooches on the other had will be begging for the rain to come, as that means they get to strut their stuff in New York Cities finest doggie rainwear! Wagwear in the East Village knows the importance of combining style and safety for our canines as they stroll down the block and feature a reflective all weather raincoat that retails for $98.00 – $125.00. If your pup is anything like mine and refuses to go to the bathroom in the rain, check out the pet umbrella on the website Pet Squared. This handy contraption retails for just $19.99 and will keep fido happy and dry in rainy day weather. Parents often look forward to the day when their little girl is the appropriate age to go and get her ears pierced. It’s a memory most of us women can remember…vividly (personally for me, it’s mostly because of the pain experienced on that day) It seems though, this quasi right of passage has somehow made its way into the dog world, as it seems more pooch parents are following a growing trend of doggie ear piercing. Now…I know there are probably several of you out there who would consider this an expression of art, but I guess my question is…is it necessary?…and furthermore, how sanitary and safe can this possibly be? I know from my own experiences with my pups at the dog park, the first thing fellow canine’s go for when playing is the ear. So why would you put a piece of metal there that is just asking to be ripped out? I know our four legged friends become children to lots of dog owners, so of course you want them to be as fashionable as possible, but I think a cute jeweled collar could be the happy medium dedicated fashionistas have been looking for. Does your pooch love a little bling? The New York Dog has a great rhinestone heart collar that retails for just $24.00. Or maybe your poochette is more prim and proper? Trixie and Peanut sells a wide range of pearl necklaces in a variety of girlie colors. As April approaches you might find yourself seeing orange as you and your pooch stroll through the concrete jungle past the Empire State Building giving off a bright orange light. No, there is nothing wrong with your vision; April marks the beginning of the ASPCA’s Prevention of Cruelty to Animals month. It’s only fitting that their signature color, orange was selected to represent this month. 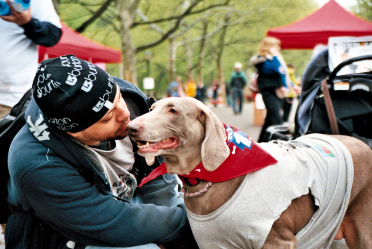 On April 7th, you can show your support and join in on a celebration, Go Orange for Animals, in Union Square Park from 4-8pm with an all out event featuring pet adoptions, live music, refreshments and of course a variety of pet friendly activities. Now, I’m guessing most of you are the over achiever type (like myself) who can’t fathom attending an event without having your pooch (and yourself) in full gear to show your support. I have taken the liberty of finding some fashion forward orange options for fido at local dog boutiques. Wagwear in the East Village makes it easy for your dog to lead the way with the bright orange nylon Metropolitan Leash ($34.00) and collar ($18.00) set. Peace loving pups can show support with the orange sunshine “Summer of Love” tank found at Trixie + Peanut on East 20th Street. Or if you have a preppy protester pooch on your hands, Canine Styles on the Upper East Side has an orange polo tennis dress ($38.00) that will definitely make a statement.